No more big quilts for a while! This one really took it out of me. It is for my youngest sister Kelly for high school graduation (she's graduating a little early). I am happy with how it turned out and I am happy that I made it, but after just finishing a queen sized quilt and then making this bigger-than-twin sized quilt, I am going to be sticking to lap sized and smaller for a little bit. I have been hoarding this stash of Habitat by Jay McCarroll for a little while and I am hoping that this was the right time to use it. Kelly told me that she likes maroon and black and turquoise and doesn't really like pink or bright colors. There is some pink in the quilt, but hopefully it is acceptable :) I have discovered that I have a really hard time making something that doesn't have pink in it. I have been photographing quilts lately on my neighbor's fence (when they are not home, of course, since I haven't asked permission), but this quilt was too big for that so we ventured to a local park. This is a very embarrassing experience for me. Our parks are very crowded and there tend to be a lot of very attractive, well dressed women there (it is in Beverly Hills!) and they always look at me weird when I am wearing sweats and trying to photograph a giant quilt by myself. The pattern that I used for the quilt is called Fire Drill and it is from Elizabeth Hartman's 2nd book. You can see her version here. I did add a column and a couple of extra rows to make it big enough for a twin sized bed, so I think the finished dimensions were about 81"x93". I got a little carried away with the quilting and did a diagonal grid of straight lines in the prints and pebble quilting in the gray solid. This is probably the part that really burned me out about this quilt, it was very time (and thread) consuming. Kelly is more than 11 years younger than I am so I am a little afraid that I am out of touch with what she would like. She was only 7 years old when I moved out of the house, and now she is a much-trendier-than-I-have-ever-been 17 year old. I obviously went a little overboard with the photos today. I figured I might as well go for it since they all thought I was crazy anyway! Since this is my only WIP, I'm going to use this post to linkup with WIP Wednesday over at Freshly Pieced. I am off to work on a quilt for my son which I have been very much looking forward to getting started! p.s. 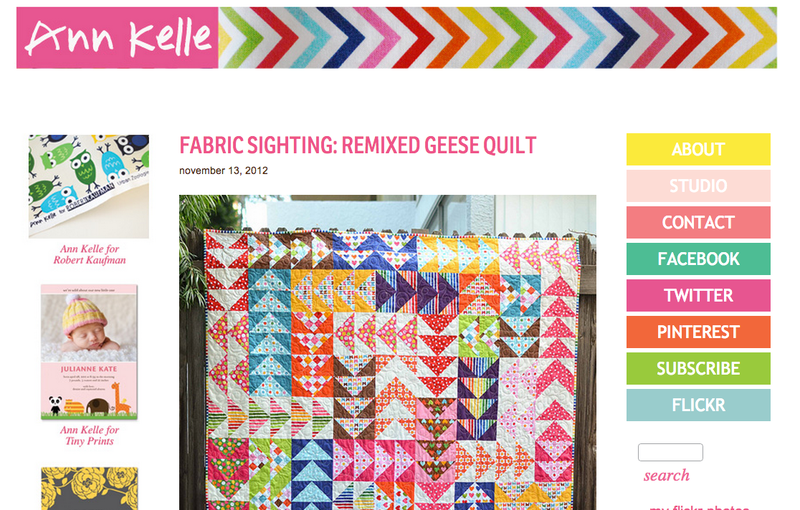 I got an email today that my Remixed Geese quilt was featured here! this quilt is amazing. 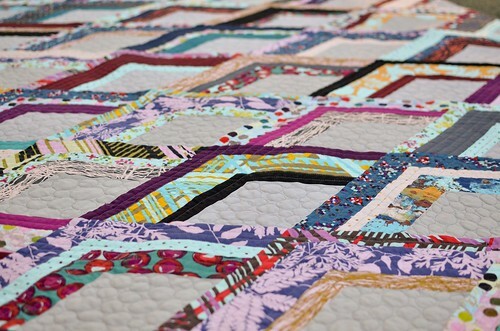 I love the pattern and all the quilting you did. I'm sure your sister will love it. wow, Erica, this quilt is amazing!!! 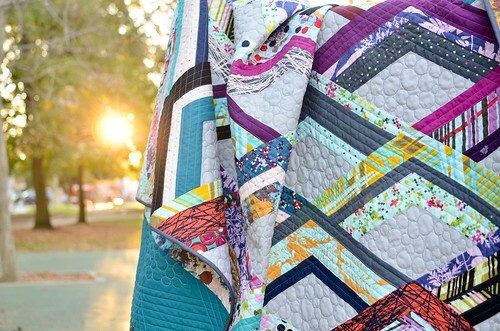 Love the colors, and the pattern, and your quilting looks fantastic. No wonder you need a break from such giant quilts. It's beautiful and I'm sure your sister will love it. It may have been a challenge, but one that was well worth it I think. The quilt is fantastic. 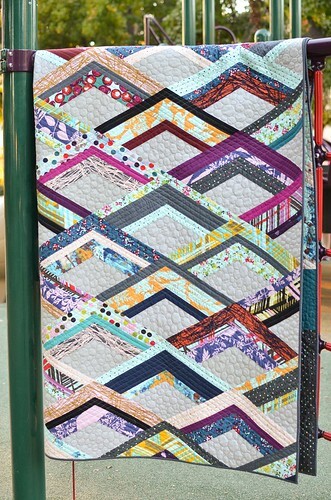 I love the fabrics, and the varied quilting is a lot of fun. Gorgeous! 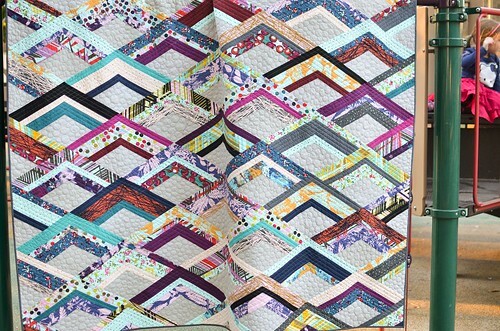 I love the layout and the quilting so much. Your photos are also very nice. :) I always have gawkers when I go out to take quilt photos, but I find that they are usually just curious. I have even had perfect strangers offer to help me on particularly breezy days. Your quilt is amazing! I'm sure she will love it!! Beautiful quilt-truly a work of love. I love the quilting you've done on it. beautiful quilt and I love the colors and pebble quilting. This is incredibly gorgeous! Great way to use that lovely Habitat fabric! I am giggling at you taking over a local park in Beverly Hills. Good for because this quilt is quite the thing and such a lovely gift for graduation. it is absolutely gorgeous - LOVE! 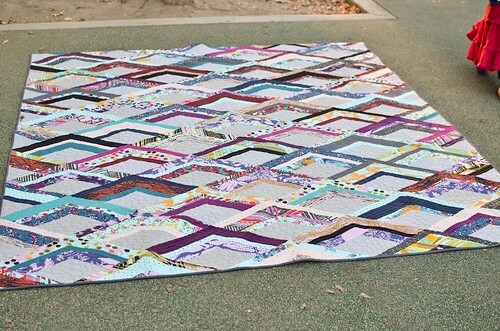 This quilt is gorgeous - gives me an idea of what to do with my stash of Center City... 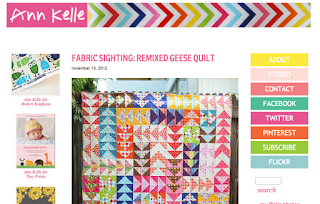 Awesome that your Remixed Geese quilt got picked up by Ann Kelle - well done! I have to admit, you made me laugh with your description of taking photos at the park! I love the quilt. The pattern is really unique! I love your quilt! The Habitat looks great and I love your quilting. And, yeah. I'm far from Beverly Hills, but I can totally relate to the joys of public quilt photography. My neighbors all think that I'm nuts. Ha! I can relate to your feelings about photographing quilts outside. I always feel like people must think I'm so strange! This turned out beautifully! I love the solids you chose to complement the collection. Nice job! Wow--gorgeous. I think the way you quilted it makes it look a bit like mountains and oceans. I love the quilting. 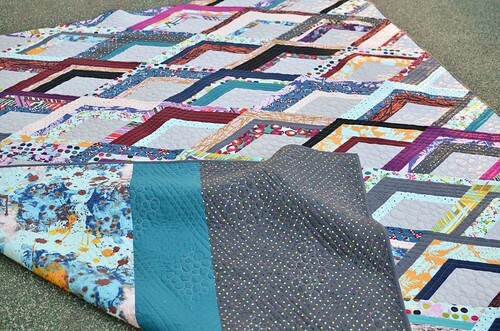 Your diamonds quilt caught my eye in the WIP links, as mine also features diamonds! You have made a lovely quilt, lucky sister! The quilting must have been time consuming but it was so worth it! It highlights the pattern so well. Great job!! Oh my, this is just beautiful. I just love the balance and colors. So well done! I think it's beautiful! I would love a quilt like this. I had a t-shirt quilt made from all of my high school tshirts when I graduated. I love the colors and i think they fit what she said she liked perfectly! I love it -- a lot. What a stunning quilt! I adore it to pieces!!!! I love this quilt. I'm definitely going to look up the pattern and fabric line now.